Use this number chart to help your child find patterns in numbers. This will help her take that first step into skip counting. Get back on track with this place value test focusing on the tens and ones place. Use a heart pattern to practise maths skills this Valentine's Day. This heart pattern worksheet gets kids to practise numeric patterns on Valentine's Day. Featuring word problems all about shopping and money, this worksheet is a great way to practise 3-digit addition. Kids practise place value by expanding numbers and smashing them back together again. 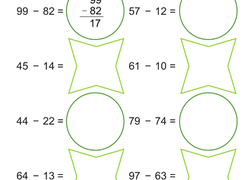 Help your second grader review place value with this quick practise quiz. 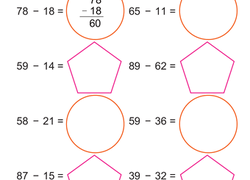 Kids practise rounding to the nearest ten, hundred, and to the place value underlined on this maths worksheet. 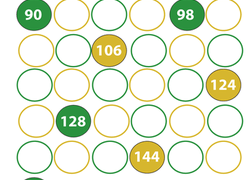 Has your little maths whiz mastered the hundreds chart? Give him a fun challenge with these fill-in-the blank pieces of the chart. 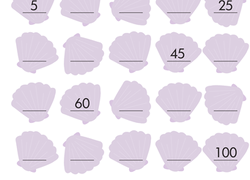 Introduce your first grader to counting by tens with dimes with this worksheet. Offering practise rounding to the nearest ten, hundred, and thousand, this worksheet is sure to help your child rocket to rounding mastery. In this year 3 maths worksheet, your child will practise writing even numbers and counting by 2 from 90 to 150 as he writes the missing numbers in the spaces. This year three maths practise worksheet is a double whammy. She'll solve each subtraction problem, and then determine whether the answers are odd or even. 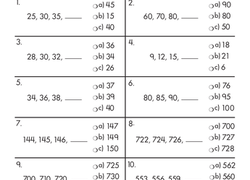 Kids identify digits to the thousands in this place value worksheet. 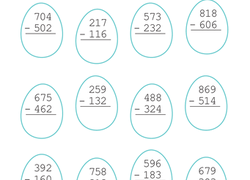 On this year three maths worksheet, kids go from egg to egg solving subtraction problems with three-digit numbers. On this year four maths worksheet, kids round to estimate the sum of two numbers, a useful strategy for checking the results of calculations. Teach your child how to round to the nearest hundred the fun way with this sea-themed worksheet featuring a swimming sea turtle and some sea stars. Does your child need practise with his maths skills? This printable worksheet, which will help him count up to 100, will give him practise counting by 5's. Give your second grader extra practise with both subtraction and determining which numbers are odd and even with this colorful worksheet! Review number patterns with your second grader with this mini quiz that asks him to choose the number that comes next in each pattern. Kids count by fives to 100 on this year two maths worksheet. Skip counting by fives is one way children can demonstrate the meaning of addition.